Today, I’m going to start out with a few points about the benefits of budgeting. For those of you that already have a budget set up, this may be confirmation that it is a good thing, but for those of you that don’t have a budget, it may present some points that will give you the push to get started. First and foremost, a budget will allow you to identify where exactly your money is going. You’ll see just how much is going towards bills, clothing, entertainment and everything else you spend your money on. This is important to know if you want to gain any sense of control over your finances. Once you have identified where your money is going and you make a budget, you may be some hard choices to make at first. Maybe you realize you need to move to a more affordable house. Or maybe you discover that drinking a Starbucks latte everyday is keeping you from taking your dream vacation. It can be hard to accept that you can’t have it all. But once you get past that point and realize that by cutting a few expenses here, can allow you to spend more over there, budgeting doesn’t seem so bad. It allows you to prioritize what is important to you, and then live by those priorities. A budget is a plan. A plan for where you want your money to go. Say you want to do a bathroom renovation next winter. Unless you plan to set aside money every month, you won’t be doing that renovation. (Unless of course, you take on debt.) Without a plan, the money can too easily be spent on $100 trips to the mall. 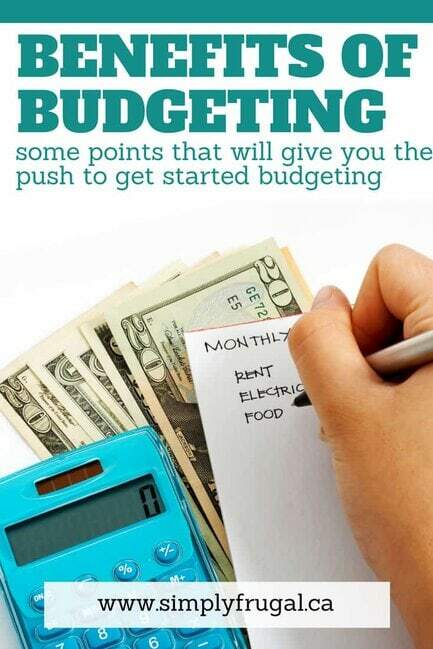 Having a budget helps you to plan and stick to your financial goals you hope to achieve. Having a budget will allow you to allocate money to an emergency fund for those unexpected situations that are bound to arise in your lifetime. A broken furnace, vehicle repairs, or an unexpected trip to visit an ill relative, to name a few. When you don’t have a budget, it’s easy to forget about those extra expenses that will most likely arise at some point in the year. Having a budget is what ensures you’ll have enough to pay your expenses. Since you’ve set aside money for your day to day expenses, annual property taxes, income tax, emergencies and what ever else you know is necessary in your life, there’s no need to stress or loose sleep. Once you start budgeting and tracking your finances you might find that you feel less guilty about spending money. Knowing that you have set aside $75 a month for clothing, for example, you don’t have to feel badly about spending it all or a portion on a pair of shoes that you fell in love with. When every dollar has a purpose, you can feel much better about spending in general. Need help getting started with a budget? My popular Budget Binder Kit will help you get on the right track! Having a budget is freeing, because you make the plan. It’s customized to your needs and wants. It’s also not set in stone. If you find that you miscalculated when you set the food budget, readjust. That’s the beauty of it. It’s your budget. Your money, working for you! What are some other benefits of budgeting? Do you have any stories to share about how budgeting “saved” you? If you have ever watched any home decorating show you have probably seen the amazing homes showcased. It’s easy to get caught up in the fact that your home might not look so professionally done. However, you can have a beautiful home that is stylish and done on a budget! With nearly any budget you can make your home stylish and welcoming. Also keep in mind that simple, timeless decorating is typically what looks the best in any home. Purchasing paint is fairly inexpensive and can change-up the look of any room. If you are ready for a change and don’t have a lot of money, consider painting. Even just painting an accent wall can turn any home from dull to very hip and stylish! Don’t be afraid to try out different colors. Most paint stores will give you little amounts of paint to take home to try out. One way to bring drama or simple coziness to a room is by adding rugs. However, you don’t have to go out and pay for expensive rugs. In fact places like Amazon, Wayfair, Walmart and Home Sense are all great places to find very large and beautiful rugs on a budget. Try to pick out a rug that adds color as you can find other accents based off of the colors in the rugs. If your rug has some red and purple in it, look for red and purple throw pillows for your couch. Lighting can make or break any room. You want to make sure you have the right amount of lighting for tasks and ambiance. Don’t be scared of trying out different lamps. Adding some pretty lamp shades, stand up lamps or even recessed lighting can turn your room into a stylish one. There are different price ranges when it comes to wall art. You can really dig into the bank account and hit up a gallery or you can go the more budget friendly route. Look for wall art at garage sales, discount stores and even at your local mall. You can also just make your own wall art with family pictures blown up onto canvas. Or, make a beautiful printable and frame it. Wall art is an area you can really get creative since it isn’t permanent. Using decor to bring some style to a room is easy and affordable. In fact just adding in some simple things like throw pillows, inexpensive curtains, candles and plants can really liven up any room. You can find these items at second-hand stores, garage sales or re-purpose what you already own. How are your creating your stylish home on a budget? This post is a sponsored post by Sun Life Financial written By Brenda Spiering. See my disclosure policy here. Saving for retirement is likely one of your top financial priorities. But did you know that how you save can be nearly as important as how much you save? Choosing the right retirement savings account can have a huge impact both on how much money you save and how much tax you pay. So, how do you choose the best type of account? When it comes to saving for retirement, RRSPs (Registered Retirement Savings Plans) are pretty hard to beat. Contributions are tax-deductible, investments grow on a tax-free basis within the plan, and RRSP funds aren’t subject to tax till they’re withdrawn from the plan. If you expect your current income is going to be greater than your income in retirement, an RRSP is a great option. It will provide you with a tax deduction that can help reduce your current income taxes. Plus, if you’re in a lower tax bracket when you draw the money out, it can help reduce the overall amount of income tax you pay. TFSAs (Tax-Free Savings Accounts) are a great retirement savings account option if you’ve maxed out your RRSP. While you won’t get to claim your contributions as a tax deduction, the investment growth is tax-sheltered and there’s no tax payable on withdrawals. 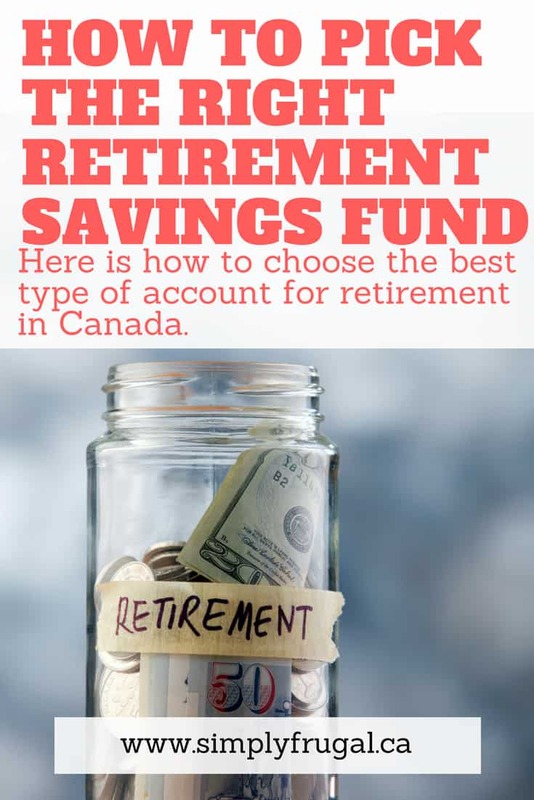 The fact that withdrawals from a TFSA are not subject to income tax also provides an advantage if you expect your income in retirement to be greater than your current income, since TFSA withdrawals do not reduce income-tested benefits like old age security benefits. Also, unlike RRSPs that you can no longer contribute to after Dec. 31 of the year in which you turn age 71 (or, in the case of a spousal RRSP, the year in which your spouse turns age 71), you can continue to contribute to a TFSA as long as you wish. How much can you contribute? Both RRSPs and TFSAs have contribution limits. In the case of RRSPs, you can contribute up to 18% of your previous year’s earned income up to the maximum limit set each year by the Canada Revenue Agency (CRA) ($26,230 for 2018), plus any unused contribution room carried forward from prior years. Since 2016, the annual maximum contribution limit for TFSAs has been $5,500, however, you can also contribute for any past years in which you didn’t contribute, back to 2009 when TFSAs were first introduced. If you’ve never contributed before, you’re currently eligible to contribute a maximum of $57,500. A great way to determine how much you need to save for retirement is to use a Retirement Savings Calculator. It can help you set an annual savings goal based on your current age, expected retirement age and desired income in retirement. Plus, it can show you the impact of contributing to different types of retirement savings accounts. To learn more about smart ways to save for retirement, sign up for the Sun Life Saving for Retirement email series. 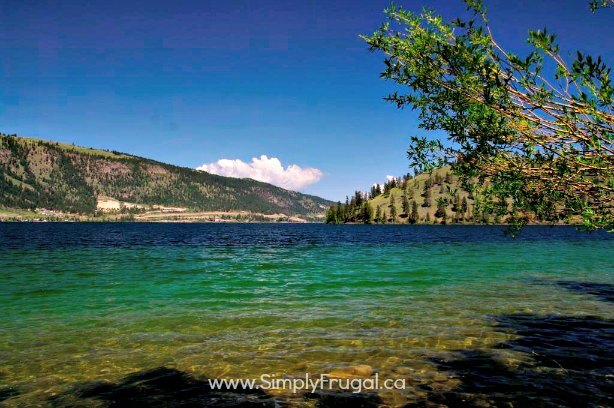 Are you living in the Okanagan or planning on taking a trip there this summer? The Okanagan happens to be the place I call home, so I thought I’d create a guide full of fun, frugal activities that take place in the land of sun. 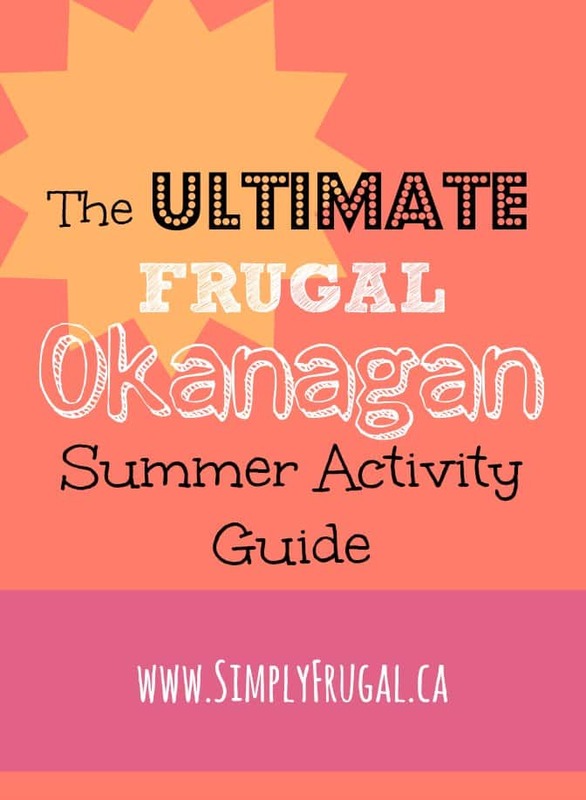 The goal is for this to be The Ultimate Frugal Okanagan Summer Activity Guide. If you have an event or know of a really cool place to visit, let me know and I’ll add it to the list! Lake Country Farmer’s Market: Fridays from 3pm – 7pm. June – September. Osoyoos Farmer’s Market: Saturdays from 9am – 1pm. May through September. Armstrong Farmer’s Market: Saturdays from 8am – 12pm. End of April – end of October. Salmon Arm Farmers Market: Fridays from 8am – 1pm. May 11 – October 5, 2018. Vernon Farmer’s Market: Mondays and Thursdays from 8am – 1pm. April 19 – October 29, 2018. Kelowna Farmer’s Market: Wednesdays and Saturdays from 8am – 1pm. April – November 3, 2018. Naramata Community Market: Wednesdays from 3:00pm – 6:00pm. June – September. Penticton Farmer’s Market: Saturdays from 8:30am – 1pm. April to October. Westbank Farmer’s Market: Saturdays 9am – 1pm. June 30 – September 15, 2018. Summerland Farmer’s Market: Tuesdays 9am – 1pm. April – last Tuesday in October. Peachland Farmer’s Market: Sundays 10am – 2pm. Open last Sunday in May – Last Sunday in September. Sun Peaks & Region Farmers’ Market – Sundays 9:30am – 1:30pm. June 17 – September 2, 2018. The Okanagan is well know for its award winning wines and wineries. Many of them offer free tours and wine tastings. See a huge list of Okanagan wineries, here. Party in the Park – in Okanagan Falls – July 6, 5pm – 9pm. Okanagan Wine Festivals – They have a great list of events that happen all year long. Cider Tasting – at BX Press Cidery. Tastings are daily from 10am – 5pm. Okanagan Feast of Fields – at The Father Pandosy Mission in Kelowna – August 12, 2018. Okanagan Spirits Craft Distillery – Tastings available all day Monday – Saturday. Rogers Bulk Food Store -in Armstrong – Open Monday – Friday, 9am – 5pm. Osoyoos Cherry Fiesta & Canada Day Celebration: in Osoyoos July 1. Kelowna Folkfest: in Kelowna July 1 from 9:30am – 4:30pm at Prospera Place. Armstrong Canada Day Celebrations: in Armstrong July 1 at Memorial Park. Canada Day Celebrations in Penticton: in Penticton July 1. Peachland Canada Day events – in Peachland – July 1, all day, Heritage Park and Beach Ave. Many Hat’s Theatre Company Presents: Self Help – in Penticton Thursdays – Sundays July 5 – 28, 2018. Caravan Farm Theatre Presents: Law of the Land – in Armstrong July 24 – August 26, 2018. 9th Annual Retro Concert Weekend – at Sun Peaks August 10 – 12, 2018. Jammin’ in Justice Live Music – in Vernon on Wednesday throughout July and August. 12pm – 1:30pm. Salmon Arm Roots and Blues Festival – in Salmon Arm August 16 – 19, 2018. Lake Country Art Walk – in Lake Country September 8 – 9, 2018. Craft and Country, Beer and Music Mountain Festival – at Big White June 30, 2018. We like to boast about all our amazing beaches here in the Okanagan. Take a look at this list of the Best Okanagan Beaches. See here for another great list of fruit stands and u-pick fruit places in the Okanagan. Rattlesnake Island Swim – in Peachland August 11, 2018. Canada Cup DH Race – at Silver Star Mountain Resort, July 13 – 15, 2018. Kelowna Across the Lake Swim – in Kelowna on Okanagan Lake July 14, 2018. Peach Classic Triathlon – in Penticton July 15, 2018. Giants Head Freeride Longboard Competition – in Summerland June 25 – 27, 2018. L’Alpe du Grand Blanc Road Bike Race – at Big White Ski Resort, July 22, 2018 from 9am – 2pm. The Okanagan has many amazing golf courses to play! Enjoy one round or make a vacation out of it! See this list of Okanagan Golf Courses. Peach City Beach Cruise – in Penticton from June 22- 24, 2018. Penticton Elvis Festival – in Penticton from June 21 – 24, 2018. Center of Gravity – in Kelowna from July 27 – 29, 2018. Great Train Robbery & BBQ – in Summerland starting June 3 – September 23, 2018. 1:30pm and 4pm. Kelowna Dragon Boat Festival – in Kelowna August 25 – 26, 2018. Okanagan Military Tattoo – in Vernon July 28 – 29, 2018. Penticton Peach Festival – in Penticton August 8 – 12, 2018. Interior Provincial Exhibition & Stampede – in Armstrong August 29 – September 2, 2018. Salmon Arm Fall Fair – in Salmon Arm September 7 – 9, 2018. BC’s Family Fishing Event – All across BC June 15 – 17, 2018. Sunshine Festival – in Vernon June 16, 2018 from 9am – 5pm. Endless Summer Show & Shine – in Summerland September 8, 2018. Funtastic Music Festival & Ball Tournament – in Vernon June 29 – July 2, 2018. Westside Daze– in West Kelowna June 29 – July 1, 2018. Summer Reading Club – at Okanagan libraries. Check your local branch for times and dates. Groupon has a ton of local discounted restaurants, spas, things to do and more! Check it out for great savings on the things you want to do in the Okanagan. Kids are not immune to money talks and they can understand finances and the value of money at a much younger age than many parents realize. Some experts even think that a child’s views on money is set by the time they are 10 years old, some as young as five or six. How you talk about money in front of them, and how you set the example for budgeting and saving is very important to how your child will form their own opinions about money. This means if you want to start teaching your kids to budget and save, it’s never too early. There are some steps you can take when they are still very small, and then the money lessons can grow with them as they get older. We’re going to look at a few ways to help kids understand budgeting and saving. For younger children, use a money jar or piggy bank. Let them see the money they are saving and have a visual of it as it’s growing. Since many people do nearly all their finances digitally now, it may be difficult for a child growing up in this generation to really understand money that they never see. You know those little eyes are always watching so show them how you budget and save. If you’re not already doing it, create a plan and get started. If you’re already doing it, but they just don’t see it, let them be involved in the process. Talk to them about the household budget. Explain what you’re doing when you go shopping together for groceries. Make talking about money, budgets and saving with your children an ongoing conversation in your household. This is how they learn. For older kids, you can start showing comparison costs. “That video game costs as much as a new pair of sneakers”, for example. Or you can give them a commission, rather than a typical allowance. Pay them based on chores they do around the house and increase it based on the number and complexity of the chores they do. This will also teach the value of a dollar, the importance of working for and saving for what they want. Explain how credit cards work. In addition to explaining that credit cards aren’t just “free money”, you also need to explain how easy it is to get in debt and why credit cards are dangerous. Explain what responsible use is long before they are old enough to have their own. Also, show by example. Now that you have these ideas on how to teach kids to budget and save, you’re ready to start applying them. If some or all of them don’t work for your family or your kids, that’s okay. Just use the ones that do work, or make modifications to these suggestions so that they do work for you! If you’re looking for even more tips and advice, check out Money Smart Kids by Gail Vaz-Oxlade or Smart Money, Smart Kids by Dave Ramsey. Both books are highly rated! What are some ideas that you have successfully used with your kids? Let us know in the comments below! We journal our thoughts and feelings, we journal what we eat, but how many of us journal what we spend? A spending journal is a great way to track where our money is going and get a clear financial picture of our circumstances. It can help us spend smarter, spend less, and make more informed buying decisions. And the best part is, keeping a spending journal only takes minutes a day! Take a look at these helpful tips on How to Create and Keep a Spending Journal, so you can take better control of your financial situation starting today. You can’t create a spending journal without a journal, right? Any simple notebook or journal will do! Head to your local Dollar store if you wish and grab a durable notebook. These $2 notebooks from Amazon will also do the trick. Label it as you wish, and you now officially have a spending journal! 2. Decide on the layout. There are several ways to layout the journal. You can create a page for each day, or create sections using notebook dividers. Use a layout that works for you. If you want to avoid flipping around, it may just be easier to use a new page each day. Basically if you spend a single dime, it gets recorded in the journal. If you earn a single dime, it gets recorded in the journal. It may be ideal to make two columns on each page, one for outgoing and one for incoming. Then, use colored pens (red and green) to decipher spending and record the information in each. 4. Analyze your journal entries each week. Once you have accumulated a week’s worth of entries, it is time to analyze them. Do your red entries outweigh the green? That could be an issue. You want to see where you might be wasting money. Fast food, coffee shop stops, entertainment, and dry cleaning may be some of the items popping up in red. The gas bill, groceries, and electric bill may be some of the items showing up in green. The idea is to cut the red column down so you can pay off more of the essential expenses. 5. After a month, add a purple column. After you have the chance to analyze your spending for the month, add one more column. The purple column is where you will put money you SAVED. If you add any money to savings or use a coupon to save on an item, write the savings in the purple column. It will be fun to see that amount grow! Related: The Budget Binder Kit is perfect for keeping track of your entire household budget. 6. Keep the journal handy. It is best to keep your journal in a purse or handbag where you can write your expenses down as they happen. If you put it off until the end of the day you might forget and info may not get recorded. Keep the journal handy and you are more likely to use it and keep information up to date. As you can see, a journal like this can really help you gain financial freedom. Consider creating a Spending Journal to see if it can help you! Have you heard of a spending journal before? Will you give it a try?